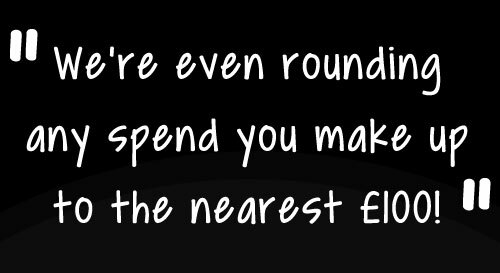 You’d be right. They are common issues. However, we can assure you that neither apply to this one! This is a weekly prize draw, running for 12 weeks (7/3/16 to 29/5/16). 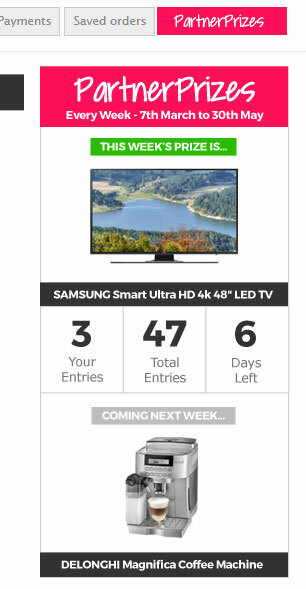 Every Monday we’ll announce the winner of a highly desirable item of tech gadgetry. Providing a whole range of customisable, white label marketing materials to help with customer communications. 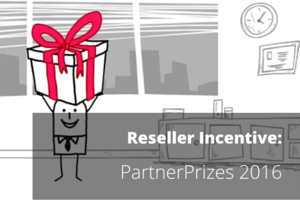 To ensure no single company can dominate proceedings, the incentive is split into 12 independent prize draws. In addition, each one is being drawn at random. So if you participate at all, you’ll have multiple genuine opportunities to win some great prizes, regardless of your company size or prior sales history. Entry to the incentive is automatic but we highly recommend you update your name and email address via our incentive landing page so we can keep you informed about your progress and more competition details. 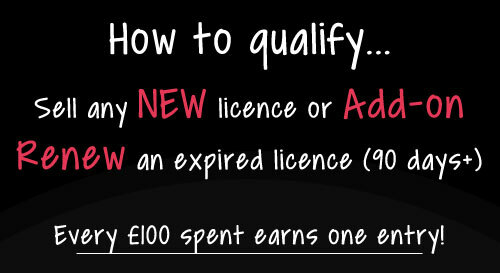 From there, all you have to do is spend over £100 on new licences (or add-ons), or renew an expired licence to earn an entry that week. 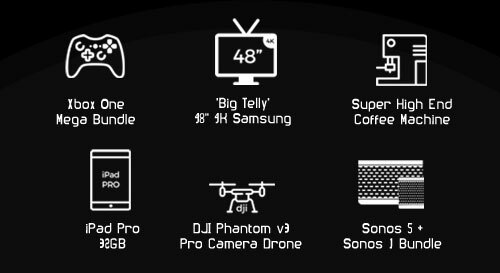 There are six different highly desirable tech prizes available to win throughout the course of the 12-week incentive. Each will be available to win twice so if you’ve spotted one your office simply can’t live without, you’ll have more than one opportunity to ‘bag it’. Below are just a few example scenarios of how we’re awarding draw tickets, basically just to illustrate the fact we’re rounding up your week’s spend to the nearest £100. For simplicity, these are based on the maximum 30% reseller discount. The materials you’ll find in the care package have been created specifically for this incentive and may not be what you’d expect from a distributor/ vendor. Marketing that’s about you, not us! Wherever possible, materials are generic, so while they sell the benefits of our solutions because that’s what you can offer as a reseller, they’re about generating interest in your company and not ours (directly at least). Let us know which materials you’d like customising with your logo and contacts.via this simple Google Form. How Can I Earn More Tickets? With only a small amount of effort, you can significantly improve your chances of winning big. It’s really the action you take that will have the most impact. Log in to your account and check your customers aren’t using expired keys. Encourage them to upgrade to the latest version and reinstate support. No brainer! Existing conversations are the perfect time for sharing information – whether via phone or email. Introduce relevant benefits and use our marketing materials to follow-up with waffle-free information. Perhaps you only sell one product at the moment? Maybe you could call your satisfied customers and introduce another? Our ‘cheat sheets’ may help get you up to speed with those quickly. We’ve made a number of explainer videos for that we’ll customise with your details so you’d be crazy not to tap us up for one or more of those as they’re prime for uploading to YouTube, Facebook, LinkedIN and so on (don’t forget a clear CTA!). Embed in your sites, share in your emails, and post across social media for free exposure. 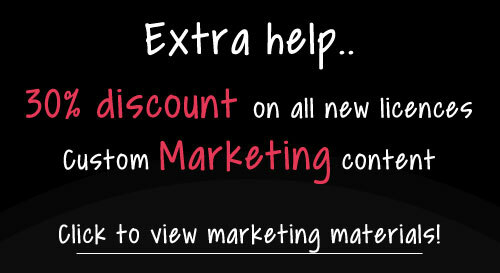 Use the standard generic content in our marketing ‘care package’ to update your web site content. Ensure our ‘cheat sheets’ are available for download. Write your own or use one of our graphic email footers in your signature line. Give your video or web content a regular mention on your social channels! Use @zensoftware for a re-tweet! Send a quick personal email about a relevant product to your existing customers with one of our ‘cheat sheets’ offering a free trial on the following (relevant) products for the incentive duration. Attach PDF cheat sheets (MailChimp templates will be hopefully be made available too). Think about a short follow-up email one week later. It’s always good to talk – call your existing customers, remind them about your services and let them know about one of our products, perhaps offer a free trial or 10% discount? Follow-up the conversation with a PDF via email and an email a week later. We’ve had success with a combination of postal, email and telephone follow-ups to new contacts. We can help with sourcing data, with content creation and also print and postage contacts. It’s not an exhaustive guide but you might find this article on our blog from the IT Marketing Agency gets you thinking along the right lines.